Shabbat Shalom! In this Torah portion, Vayetzei, Jacob has a dream in which angels go up and down a ladder connecting earth to heaven. God appears before Jacob and renews the covenant that God had made with Abraham. Jacob sees Rachel, Laban’s daughter, tending sheep and wishes to marry her. Laban tricks Jacob into marrying his eldest daughter, Leah, after seven years of labor. In exchange for another seven years of work, Jacob is allowed to marry Rachel. Jacob has many sons with Leah, but Rachel is unable to conceive. Finally, God blesses Rachel, and she has a son, whom she names Joseph. Our Musical Friday Evening Services are Tonight at 6:15 PM. There is a a Young Professionals’ Shabbat dinner following services for those that rsvped. Shabbat morning services are at 9:15 am tomorrow morning. Tomorrow is Men’s Club Shabbat. We will honor all of our US Veterans who are part of our congregation. Our first Family Service was a great success, and we’re so excited to do it again! This is a monthly family-oriented Shabbat service for our K-6th grade students and their families. 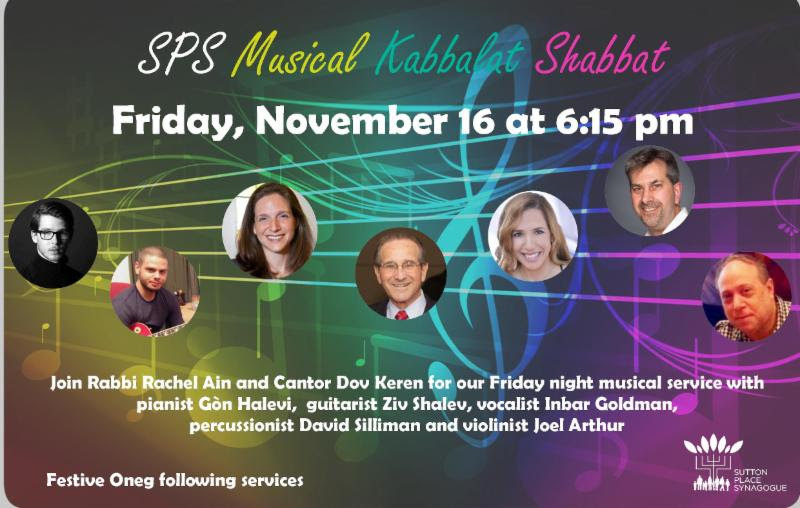 Families will pray, sing, and learn together through discussion, activities, singing and learning more about Shabbat services. Candle lighting is at 4:18 pm. Thought Question: Did you ever, like Jacob, have to run away from a problem? Did you feel you made the right decision? Did Jacob? Please note: The synagogue’s schools and offices are closed next Thursday and Friday morning. There will be no minyan Thursday in the morning or evening, or Friday morning. We will resume together for Friday evening shabbat services. Closing the building gives our entire staff the opportunity to celebrate Thanksgiving with their families. HAPPY THANKSGIVING! Our Monthly Study of Rabbi Naomi Levy’s book, Einstein and the Rabbi, continues tomorrow following Kiddush. The class will take place in the sanctuary. There is a KNS Family Fun Day this Sunday from 4-6 pm. CLICK HERE for more details. Dr. Ruth is coming to Sutton Place Synagogue on Wednesday November 28th at 5 pm! Don’t miss out on this special opportunity where world-renowned speaker and teacher, Dr. Ruth, will present her incredible story by sharing her new book, Rollercoaster Grandma! This event is geared to our students and their parents but the entire congregation (and friends are family) is invited. Our 3rd-7th grade JRS students will come to the sanctuary to hear her presentation. Chanukah 2018 will be here before you know it-Mark Your Calendar for these great events which include a dinner and program for a tot chanukah event for our pre-school families, a Wednesday evening dinner and program for our elementary and middle school families, and a congregational Shabbat experience with Cantor Beny Maissner. CLICK HERE for more details. We have two very special events in January! On Sunday, January 13th we will have an all-day symposium exploring the relationship between Judaism, Genetics, and Science! On Saturday January 19th, we will have the incredible opportunity to hear from Ian Manuel, as we learn his story from incarceration to redemption. Stay tuned for more details.